I love hummus. I got into making homemade hummus when I lived in Norway as you can not buy it ready made as easily as in the UK. I now make homemade hummus lots. This is one of my new favourite hummus recipes. I had a beetroot in the fridge desperately needing to be eaten. 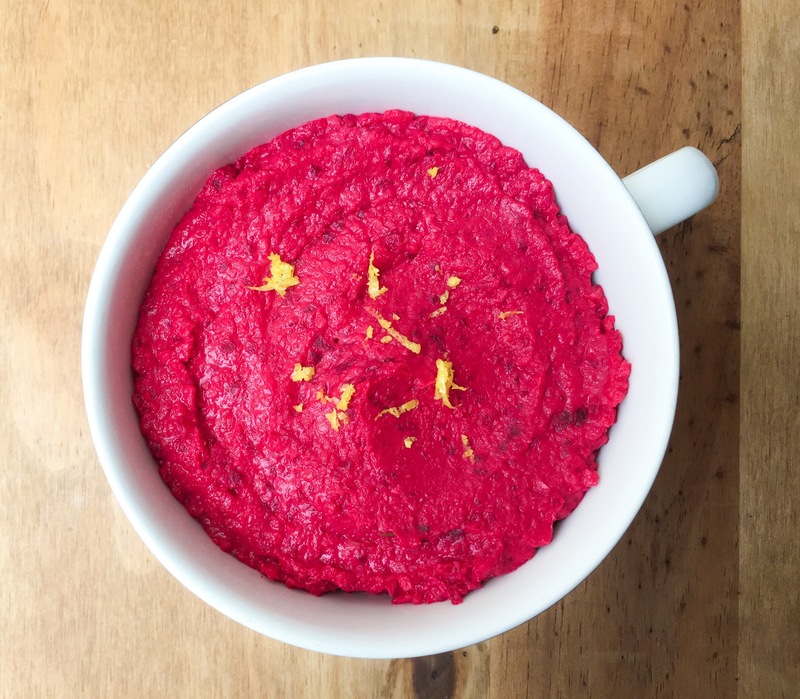 I love how vibrant this hummus is, but it is not style over substance it tastes amazing too! I use the garlic which I roast the beetroot in rather than fresh garlic as the sweet garlic goes wonderfully with the earthy beetroot. Halfway through making this I realised I was wearing a white jumper, thankfully I managed to avoid staining it but I would advise against wearing white while making this just in case! I have been thinking a lot recently about what I would have cooked for my sister’s wedding if I was to cater it now. I think this would definitely have been one of the canapes, although my sister may not have wanted it incase she got it on her dress! This can be used as a simple dip with vegetables, flatbread, pitta bread, as a topping for smørrebrød or enjoyed with roasted sweet potato and potato wedges as a main meal. Pre-heat your oven to 180C. Place your beetroot on a sheet of tin foil, add the garlic cloves, a couple of sprigs of rosemary and lemon thyme. Sprinkle with a little salt and pepper then drizzle with olive oil. Fold the tin foil to make a little parcel then place in the oven for 35 minutes. Once the beetroot has cooked, let it cool then peel the skin off, cut into quarters. 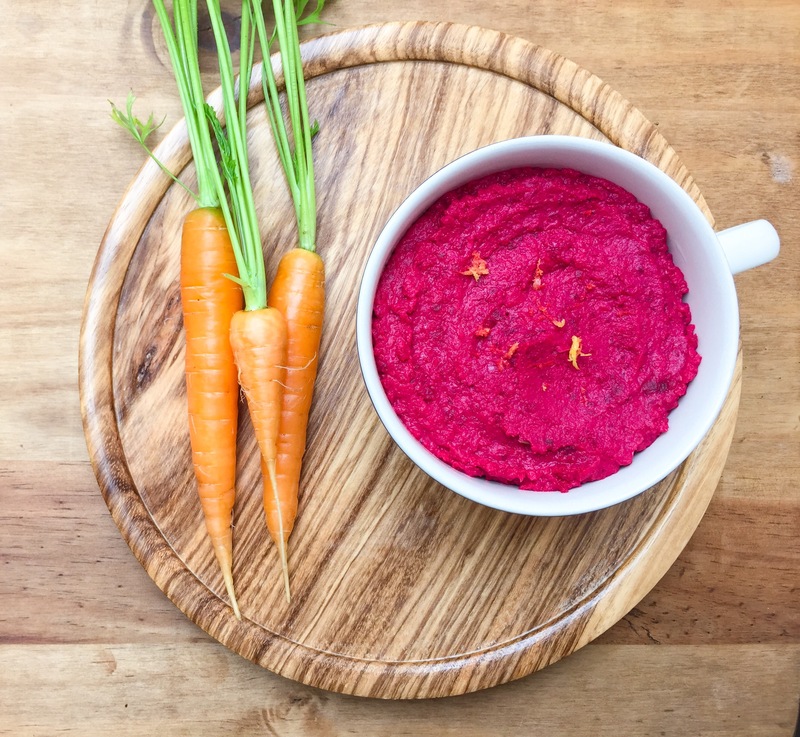 Place the beetroot, roasted garlic, lemon zest and juice into your food processor and blitz for 2-3 minutes or until smooth. Add the chickpeas, tahini, olive oil and salt and pepper, blitz for a further 5-10 minutes or until smooth. Such a great colour, maybe not for white jumpers though! I’m always looking for new hummus recipes, so this is great – thanks! Wow – that is some seriously beautiful hummus. My children LOVE hummus. Making it this color would blow their minds. I’m definitely going to give it a try. Beautiful color! 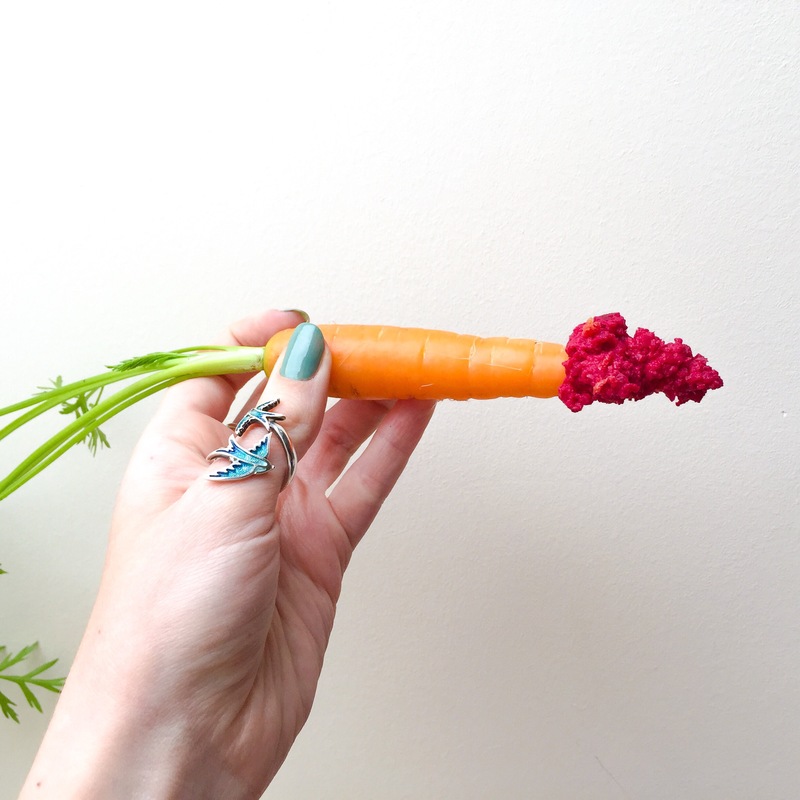 Great idea to liven up hummus this way. I love beets and this is a great recipe! !